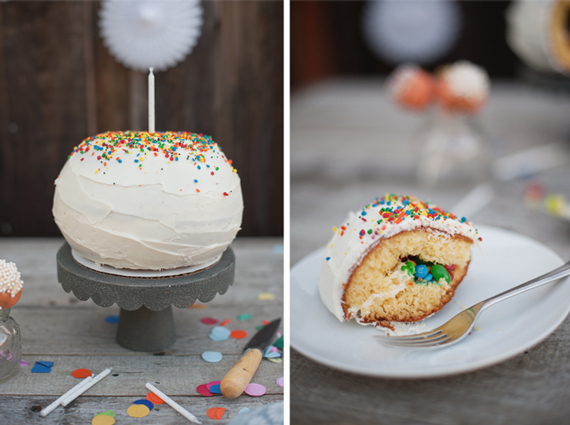 You guys, we made a pinata cake!!! My dreams have just come true. There is not much I like more than pinatas for birthday parties. Their festive nature just seems to make any day more special. I woke up at 2 am one night with this crazy idea that we could make a birthday cake that would hide treats inside, just like a pinata. 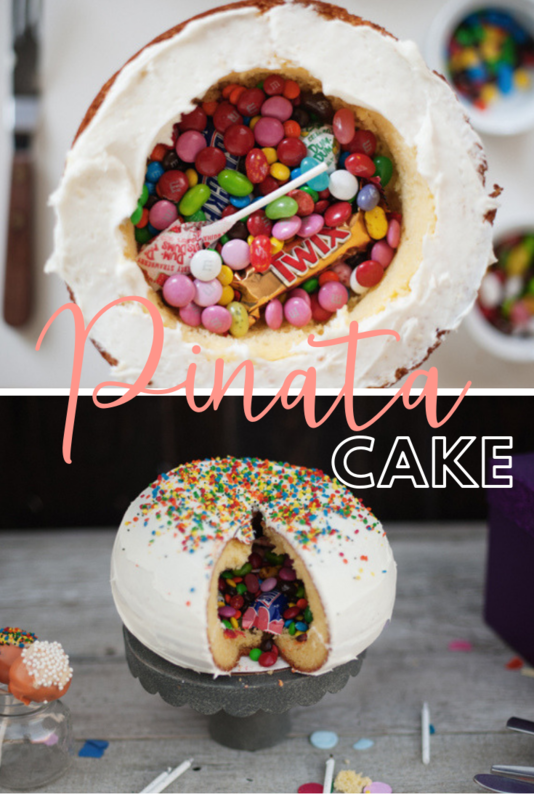 A pina-cake, a cak-ata, a pinata cake! I worked with my friend Athena to make it happen. I could not be happier to share that it is possible and really easy to produce at that. Serve one up at your next birthday party to wow your guest of honor with treats inside their treat (so fun!). a 1.5 quart oven-safe bowl (greased and floured) and an offset spatula. Make cake mix according to box directions. Divide batter equally between two bowls (or use the same bowl and bake one cake, followed by another, allowing bowl to cool in between). Bake cakes at 350 degrees F for 45-50 minutes. Check cakes for doneness with a toothpick or skewer. Remove cakes from oven. After 10 minutes carefully turn cakes onto a rack and allow to cool completely. Arrange a plate over the cake and flip over so that the cracked side faces up (the smooth side should be on the bottom). With a sharp knife, cut evenly all around the top of the cake to remove the dome. Repeat with other cake. Lay a cake with the exposed side up (the side in which the dome has been removed). Using a knife, make an outline of a smaller circle within the cake, leaving about 2-3 inches from the edges. Gently scoop out the inside with a spoon, going down a few inches (credit Brian at dh inc). Be careful not to puncture the cake on the sides or bottom. Place the crumbled cake pieces in a separate bowl and save (they can be used to make cake pops later). Repeat with other cake. Place one cake on a cake plate/stand (feel free to use a cake board), hollowed out center facing up. Apply frosting to the lip of the cake all around; this will allow the other cake piece to adhere when placed on top. 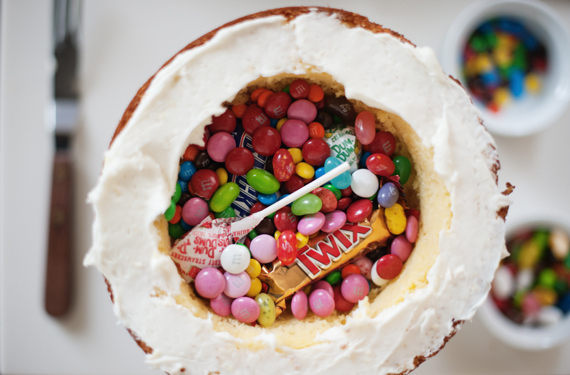 Fill the hole with assorted candies. When done, carefully place the other cake on top of the candy-filled cake, making sure to line up the edges. With an offset spatula, apply a crumb coat of frosting to the pinata cake (tip: put strips of parchment underneath the cake for an easy clean-up!). This initial frosting secures stray crumbs and allows for a neater, finished look when the second frosting is applied. Place cake in the fridge for 15 minutes to chill. Remove cake from the fridge. Apply a second coat of frosting. Decorate the pinata cake as desired (we used confetti sprinkles). The first cut of the cake will reveal the surprise of candies and treats inside! After the initial piece is taken out, the rest of the cake must be cut or it will cave in. Enjoy! **The leftover cake that was removed earlier can be used to make cake pops. P.S Use this same cake recipe to start on other birthday cake ideas a 3 tier Smorgasbord cake or an an editble balloon birthday cake. Plus a pumpkin cake would be something really easy and fun to fill with sweets! Photography and styling by Athena Plichta under the creative direction of Victoria Hudgins. This is so incredible, great idea! The cake looks glorious! I LOVE IT! It’s so beautiful without the candy, and then…..the candy! Love this one. Wow! Thats great I can’t wait to surprise my niece and nephews. How mine comes out as nice as yours. What size batter bowl did u use? I have both pampered chef ones. Oh my goodness! I kid you not- my heart skipped a beat! What a brilliant idea! My kids would die… I would die! this cake’s gonna go viral. i kid you not. I LOVE it. My son would love it. His birthday’s not until October. Maybe a ‘just because it’s fun’ type of cake. Love the idea , its just so so wonderful !!!! Oh wow!! Love this idea – so unique and fun! Definitely need to give this a try for a birthday cake for me or my husband in the next couple of months! This is one of those projects that seems crazy no one has thought of before. It is sooooooo super cool. Thanks for the fun! This is such a fun idea for a cake…love it! :) Have to share! This is so fun Victoria!! Maybe if I can get my act together I’ll make one for Henry’s birthday on Saturday! This is EASILY one of the coolest things I’ve ever seen! I once saw pianta cookies, but them seemed to be almost impossible to make. I would have never thoguht of cake! How fun! I can only say: Thanks for this idea!!! I love it!! This is perfect for my daughter’s birthday dance party this summer, I will have to make it look like a disco ball! Thank you for the great tutorial! Robin, what a great idea! You’ll have to send over photos if you make it. Silver baking glitter might work – how fun! Cool! I love this Piñata Cake!!! love this idea! What kind of bowls do you use to make the cakes? Hi Tina! I used a 1.5 quart oven-safe glass bowl by Anchor Hocking to bake this cake. I’ve heard you can use stainless steel mixing bowls in the oven but I’ve not personally done this. Hi…I love this idea and it seems pretty easy. I was wondering if I didn’t scoop out the top half of the cake if it would make it more stable and prevent it from caving in…what do you think? Also, what kind of bowls did you use to bake the cakes in? Thanks…Great idea for my daughters 3rd birthday! truly, truly brilliant! i want one. Betty Crocker makes a “Bake’N Fill Pan” which I have used with great success. This would make an ideal Pinata cake. I was just going to leave a comment that I’m going to try this in my bake-n-fill pan. You beat me to it! :) It won’t be so round on the bottom, but I think it’ll be really easy to do! I think If you actually made one side hollow, the other side just slightly hollowed, so scoop out only an inch or so of cake to make a slight indention. Then, fill the more hollow side with your candy, place the other cake half on top, then flip it over. Your solid cake half would be on bottom, supporting the top part. 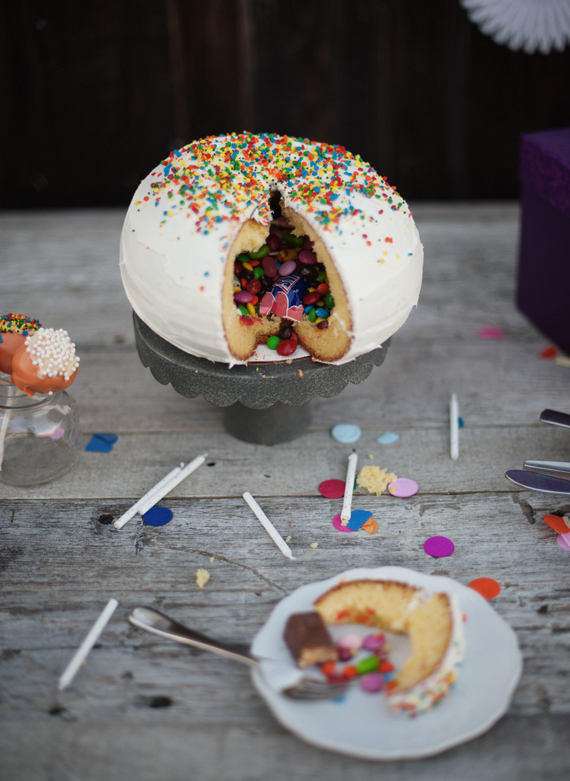 I’m not sure if the more hollowed cake half would support a more solid half, due to the weight, but the solid half would definitely support the hollowed out cake w/ candies. Cute idea though! Have pinned this for future reference. Perfect cake for a Cinco de Mayo birthday. Thanks for sharing! I will be adding Ice cream!! This is such a fun cake! We have no birthdays coming up so I’m just going to try this one for fun soon! A fantastic idea that I will definitely be using! What a fun and surprising cake! My cake is baking in the oven now! My husbands birthday is tomorrow. I’ve been to no less than 5 stores looking for his favorite candy! Question – Do you think I can fill it this evening (yes sorry for the short notice on need of advice!) or will the candy start to discolor the cake? or worse my gummies won’t be gummies by tomorrow? Some of the candy is wrapped some is not! I’m debating whether to just wrap the cakes and stick them in the freezer till tomorrow, but my kids REALLY want to help me fill the cake and if that is going to happen it has to be this evening! Yogurt cakes sounds amazing- I’d love to see a recipe! I saw this cake on Pinterest and fell in LOVE! I want to make this right now! It is so colorful, fun, and great for any type of celebration. Thank you so much for sharing. Thanks so much for your response Athena…you did a beautiful job with this cake! I will be looking for some bowls because I am definitely making this for Lila’s birthday! It’s so fun and the kids will love the surprise inside! Wow, I love this Idea! I also love that the cake was round instead of just ordinarily shaped! Love this idea! Am going to make it for my son’s upcoming birthday party! Thanks for sharing it (and thanks to Babble, for posting it also). To avoid the dome and save some time, bake at 300 for about 90 minutes. It takes longer when baking but it saves on cutting off the tops. You can just start carving out instead. What type of bowl did you bake it in? They don’t crack? I always look for neat ideas for cakes, this is a cool one!! I just made “mini” Pinata cupcakes! A couple of gummy bears and about 6 m&m’s are a perfectly sweet fit. Thanks for the big idea for my mini version! Do you think you could fill it with fruit? I have a ton of strawberries and blueberries left over that I’d like to use up! I’m not a baker, by any means, but what if you coated the cavities with chocolate and allowed it to cool and harden? Would that give it stability? Do you think instead of candy you could fill it with ice cream without having to change anything else?! It’d be a real great way to make a simple ice cream cake as well I’m thinking. You could use this for a holloween party. Just decorate it as a jack-o-lantern or a skull perhaps. You could also use the round betty crocker bake ‘n fill pan 2 times, and just use the hollow that makes too! Just found this great idea. I’m thinking that this would be fun for Easter. I will fill robin eggs, jelly beans, and chocolate eggs. Now, to figure out how to make it into an Easter egg. I have cake pans that make the hollow center for you. I bought them to make my son’s First Birthday cakes years ago. I filled them with pudding and marshmallow creme, etc. Never thought about candies. What a great idea. Thanks for sharing! Another idea would be to use a Betty Crocker Bake ‘n Fill pan if you have one and just put the candy in there instead of a filling! Help! I baked one of the cakes last night in the glass bowl. Middle was still gooey 40 mins in and sides were brown! It’s so hard to bake a shape like this evenly, also my oven is older. Any tips on how to bake this evenly in a deep glass bowl such as this one? I rotated it frequently. Love this idea! Especially sweet if the cake was a surprise and the birthday boy/girl was made to slice it! I would be putting smarties, peanut m&m’s and reese peanut butter cups in mine :) yum. I love the idea. I wonder who well lining the hollow with solid chocolate would work, at least on the bottom one it might be too heavy for the top half. Hmm you would have to use tempered chocolate then freeze or refrigerate to set it. I will play. 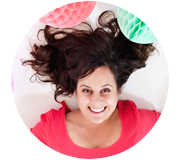 Pingback: Project Piñata | Procrastibaking! I am so making this for Easter. What if you used wedding cake pillars. To hold cake up after the first cut??? I love this idea. It got me thinking…. can I put jello in the middle instead of candy? This is an awesome idea with the cake. After reading through the directions I think I’ll try to make one for my granddaughter’s 5th birthday. Gonna make this for Easter Picnic. My daughter and I are making this right now for my boys when they get home from their dad’s house tomorrow. I can’t wait to see their faces. I made this cake for our monthly birthday cake day. It was a hit!!! Brilliant! Love it, made it today for my daughters birthday party, great success! This has got to be one of the best ideas I’ve seen in quit some time. I have a daughter who will be 12 next month and this is totally going to be how her cake is done. I love this cake!!! As a kid, I would have flipped out if my mom made me a cake like this!! This is def going on my bucket list to make here soon for my cousins birthday. So much fun, and it doesn’t look too hard to make at all. Thanks for the great idea!! Love this idea! And it seems fairly simple! I love it when you can give something a unique twist……very easily! And using the leftover cake for cake pops is a good idea too. This is a great idea my grandsons would love this for their Birthday Party! I’m making this cake for my boyfriends nephew on the weekend. How would you suggest packing it for travel? I plan to make the entire cake before going to the party. thanks for share that wonderfull idea.!!!!!!!! I’m loving this. My son and his wife are both teachers and their 2 daughters might like it with gummy worms and iced red like an apple! Brown stem candle and leaf to complete the look! I am going to put mini liquor bottles in instead of candy for a 21st bday cake! I’m so glad I found this post today! I made this tonight for my son’s birthday party tomorrow. The finished product is beautiful and I can’t wait to cut into it. I used the one-bowl method that another commenter suggested. 90 minutes at 290 did it for my oven. The shape isn’t a perfect circle, but it was super easy and quite pretty. Thanks again! it was a bit difficult to find the bowl here in switzerland but I manage to make it for my baby’s 1st birthday and everybody Looooooveeed it! I usually try to bake the whole thing but using a cake mix box was brilliant because I was risk free, originally I did the piñata cake only for the kids but grown ups asked for it too!!! Do you think this would work on a smaller scale? I was looking at making it individually sized with a bowl that is 5″x2.5″. I like this cake,easy to bake. This is so incredible, great idea! The cake looks glorious! Thanks again Victoria for a great article!